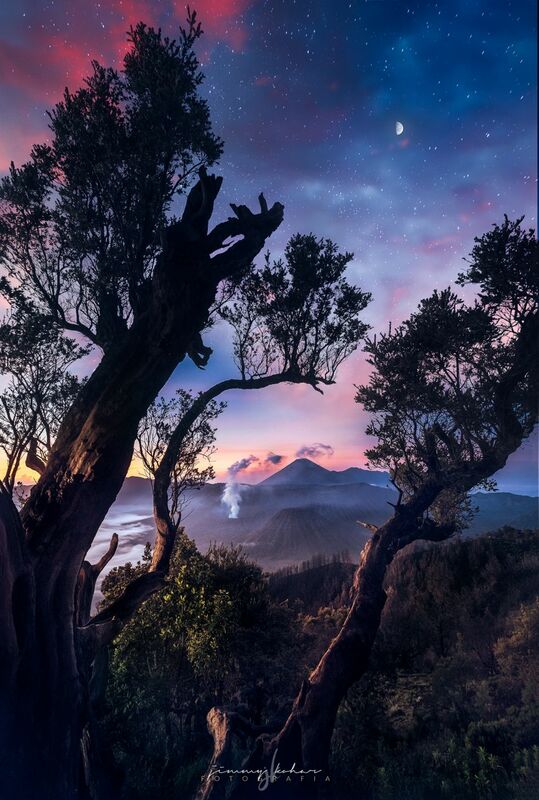 There's a secret place hidden just about a hundred meters or so away from the popular spot of viewing Bromo sunrise in Penanjakan 1 viewing spot with an ancient looking tree, and a hill with an almost private panoramic view of Mt. Bromo. Take a walk to the right after reaching the sunrise viewing spot and you will find a tiny entry through a broken down fence down to the hills. You will need to bring a flashlight as it will be pitch dark and trekking down the hills although short but are quite steep. I hope this place would somehow be hidden as the spot is small and the spot with an ancient looking tree framing Bromo would only comfortably fit 2 tripods. When I was there there's up to just over a dozen people who showed up to the spot, instead of 2oo's on the usual normal viewing deck. I hope there won't be too much people around as the spot was quite neat and still pristine. Please take your trash back with you. Thank you Jimmy Kohar for creating this photo spot.